Browse Eat & Drink for more articles like this. Boat on up to Lake LBJ’s newest restaurant on the water. 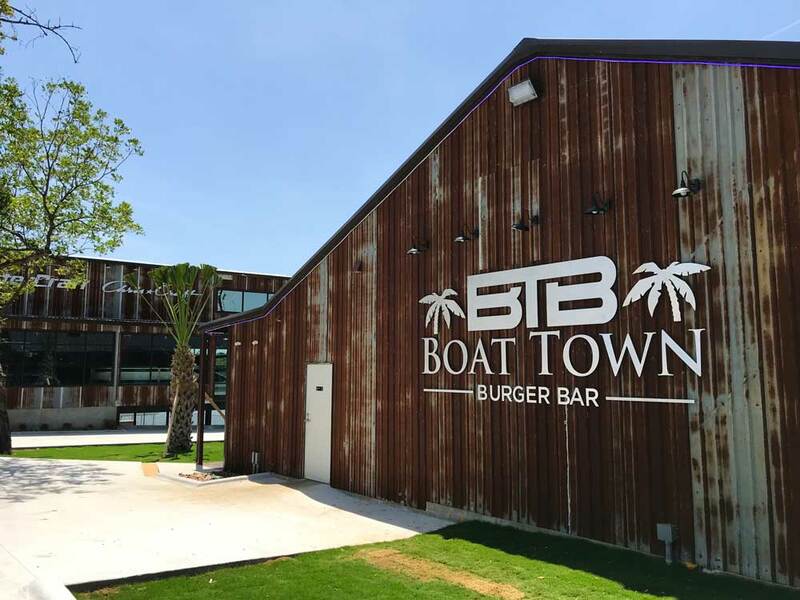 Urban Austin meets laid-back lake life at Boat Town Burger Bar, which will be serving fresh food and cold drinks all summer long. The restaurant sits on Lake LBJ near the 2900 bridge in Kingsland. It faces due south, so there are no sun issues in the afternoon. The cool lakeside breeze makes for a comfortable atmosphere, and plenty of shade allows guests to comfortably sit on any of the three lakeside patios, even when temperatures creep above 100 degrees. There’s a sandy beach for the kids, picnic tables, palm trees, and a lush expanse of grass. “Parking” isn’t a problem here, either. There are 35 boat slips and room for 10 watercraft. Personal watercraft, speedboats, sailboats, and even seaplanes can find a spot at the dock. For guests who prefer to roll up on wheels, there’s a parking lot in the back next to the full-service Boat Town dealership. 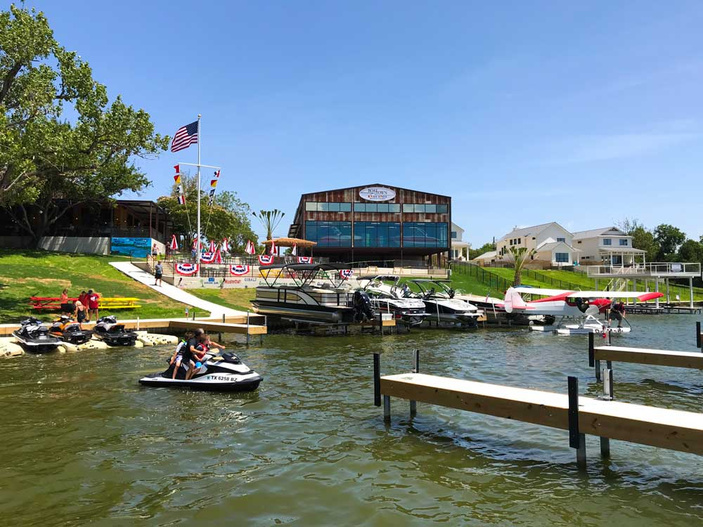 Boat Town Burger Bar comes by way of the Texas capital, where Joyce and Louie Raven — fifth-generation Austinites — opened the very first Boat Town dealership in 1961. Boat Town soon became a successful family business, growing purely by word-of-mouth. In 1986, it was time for Louie to pass the torch to his son, Clayton, and daughter-in-law, Karen. As Austin grew, so did the dealership. In November 2017, the family decided to expand to a second location in Kingsland, this time with a lakeside restaurant attached. 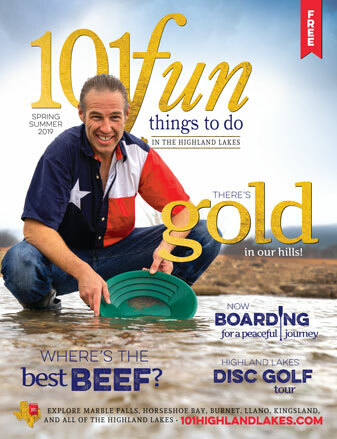 Kingsland was a fit choice for their business model, which was further solidified when they toured Lake LBJ after deciding to open a dealership in the area. The restaurant opened in early July. Guests can build their own burger with gourmet, high-quality ingredients or choose from among signature menu items such as the 3 Chile Burger, the Ranch Hand fried chicken, and the Mayflower lobster roll. Ice-cold beers and cocktails are served as well. Be sure to try the Mastercraft Mule or the Barletta Banana Colada, drinks paying tribute to the big-name watercraft brands guests can view inside the Boat Town dealership. 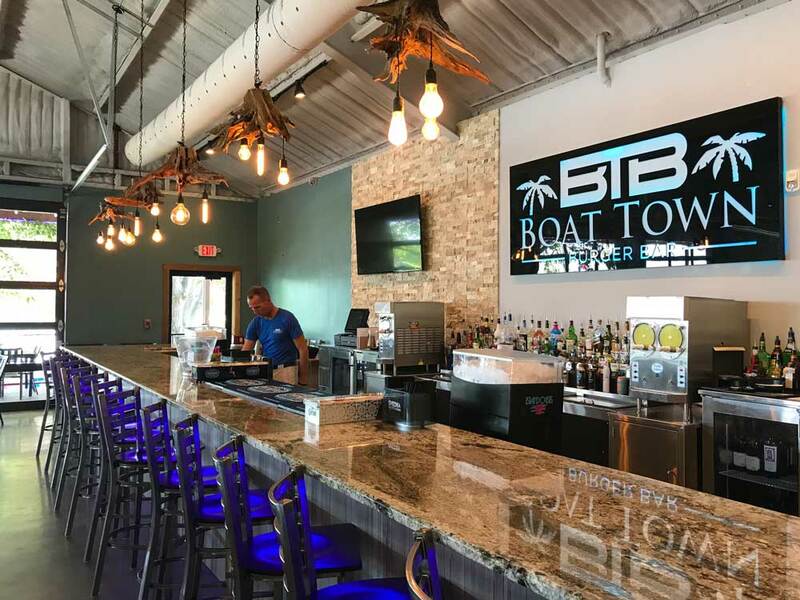 Boat Town Burger Bar is located at 151 Melodie Lane in Kingsland and open 11 a.m.-9 p.m. Sunday-Thursday, 11 a.m.-10 p.m. Friday-Saturday. Visit the website or call (325) 388-4343 for more information.